Scotch Brand Adhesives - Today's Sponsor! Thank you so much to today's sponsor and for providing a give-a-way for our viewers. 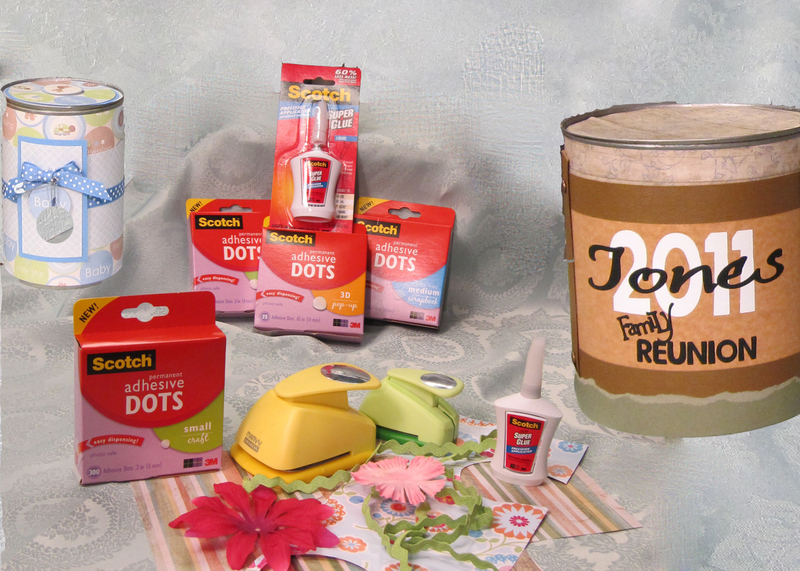 Using Scotch brand adhesive dots and super glue we created a unique way to, not only recycle cans, but use all those scraps laying around to creatively wrap your next gift! We used the glue dots to attach the paper around the can and secure all of the embellishments. Place your gift inside the can and make sure to leave about a 1/2" space at the top. You do not want to get glue on your gift. Our final step was to use the Scotch Super Glue to glue the lid back in place.... your wrapped can is ready for giving. First we used a "safe edge" can opener, one that does not leave sharp edges when you remove the top. Wash, dry and disinfect the can you will be using. Next take your scraps of paper, ribbon and other embellishments, and get creating your unique masterpiece. The next time you need to wrap a gift..."CAN-IT"! Scotch Adhesive Dots for scrapbooking and crafting have a new "no touch design". Each dot is dispensed on a clear tab, so you can place the dot exactly where you want it without touching the dot...no finger oils on the adhesive. Scotch Super Glue is now in a precision applicator. Precise application with 60% less mess than other metal-tube super glues. This new patented droplet control technology dispenses one droplet at a time, like an eye dropper. The design of the bottle acts as a spring, sucking adhesive back in when the user stops squeezing the bottle. Both of these adhesives are available at local Target and Shopko locations. You can also visit their website.